Shallow water is challenging if you own a motorboat, since although the boat itself may draft just a few inches, the outboard’s propeller must operate several inches below the lowest point in the boat’s hull, and practically speaking, you need to drive in water that’s at least one foot deep. This leaves you with an alternative mode of propulsion, namely poling, and since poling is slow and hard to practice, at least for most people, it doesn’t really solve your problem. Mud motors are an effective solution for this problem, and they are fun to operate. Another alternative to conventional motorizing is paddling, but motorboats, even small ones such as Jon boats, are too wide for their crew to paddle effectively, so paddling doesn’t really work over significant distances – unless you own a Wavewalk® 700 car-top skiff. The special thing about this new boat is that thanks to Wavewalk’s patented invention, it is extremely stable (watch video » …) and being just 31″ wide, it offers comfortable, easy and effective paddling, whether with single blade (canoe) paddles or dual-blade (kayak) paddles. This boat is ultralight (80 lbs without the motor), and thanks to its patented twin hull (a.k.a. catamaran) it tracks better than any kayak out there, and it’s easy to paddle solo and in tandem. In fact, the 7’8″ long W700 cockpit can accommodate a crew of up to three small to average size adults, or two big guys. The W700 is so stable that anyone, including big and heavy guys can drive it standing, paddle it standing, and fish standing in it in full comfort and confidence. Even one person can car-top their W700 without help from a fishing buddy, so you don’t need to launch it in boat ramps, and you’re free to launch it anywhere – beaches, docks, etc. Although shallow water is a popular fishing ground for many kayak anglers, fishing, paddling and motorizing in it aren’t necessarily easy, and they can be quite a challenge. Whether you want to fish in flats or marshes, flooded grass, shallow streams, rivers obstructed by rocks and logs, or near oyster bars and rocky beaches – our W500 fishing kayaks offer you unrivaled mobility and stability, and the overall performance allowing you to go and fish optimally in all types of shallow water – W kayak anglers have dubbed it the All-Terrain Kayak for good reasons. You’ll find that poling your W fishing Kayak is easy. We recommend that use use a Wavewalk paddle that’s longer and sturdier than kayak paddles. The advantage of using our extra-long and sturdy paddles is that you don’t need to carry a poling pole on board. Some shallow water W kayak anglers use a poling platform. Although such platform is easy both to make and install, we don’t recommend using one, since it is stabler, safer and more convenient to pole while standing on the bottom of the kayak’s hulls. 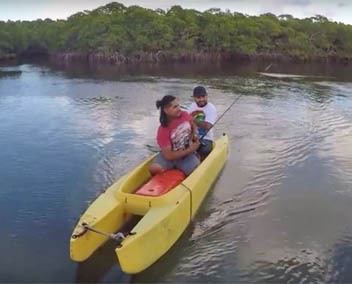 It’s important to understand that being able to get up and stand on a kayak doesn’t necessarily mean you can actually fish standing on it with confidence, or even in minimal comfort or acceptable safety. Furthermore, being able to stand on a kayak doesn’t mean you can paddle it at a reasonable pace (and distance) if it’s either very wide and therefore slow, and/or features outriggers and a rudder that further slow it down. This is especially true if the water and weather conditions are less than perfect, which is pretty normal, unfortunately. This is to say that sight fishing requires that you can stand up easily and confidently in your kayak, including switching instantly and effortlessly from a seated position of a standing one, as well as cast and land fish comfortably and safely, and paddle easily and swiftly over long distances. The W kayak is only kayak that offers you to do all of the above. Unlike all other fishing kayaks, the W500 series offers you the ability to easily and comfortably paddle while standing, in full confidence, knowing that in case you lose balance (stuff happens!) you’re likely to fall into the Riding position on the 14 inch high saddle between your legs, and instantly regain your balance, and the control of your kayak.